Join the fun on our Facebook page. Get up-to-date information regarding dog treat recalls, new dog treat recipes and my answers to dog treat baking questions. You can also read this newsletter online. "Do these dog treat recipes really work?" "Do dogs really like the recipes, even the ones vegetables?" "I have 5 goldens, aka "cheese monsters". I made these, but instead of jam .... used low fat cheese instead. Wonderful! Thanks so much!" "I made half with jam and half with cream cheese. My dogs loved them. I'm so happy I made them!! I love all the recipes on this site! This is such a wonderful website!!" 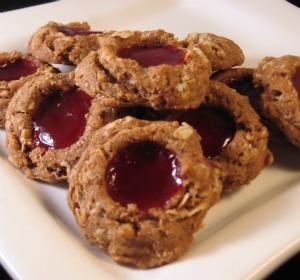 "Remembering "people" thumbprint cookies my Mom used to make where the cookies were filled with the jelly prior to baking; I tried that method with these thumbprint cookies with success. Overfilling does result in jelly overflow and a messy cookie sheet however. My Brouzer (Brussels Griffin/Mini Schnauzer mix) did all her best tricks for these cookies!" 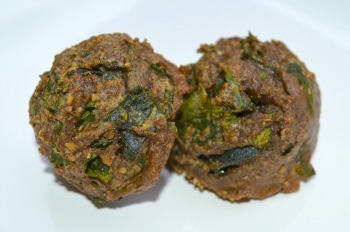 Collard Greens Dog Treats - The second dog treat recipe is one that you may not be quick to try, but your dog would surely miss from her treat schedule. "I decided to make these cookies, it was a rainy day. I went to the store to get everything, however, they didn't have buckwheat flour so I used another non gluten flour. I have 3 dogs and one of them loves almonds to death which is what attracted me to the cookie. My 3 pups loved them so much, each had one and licked the bowl, that I have decided to share the treats with all my friends' dogs and make more tomorrow. This was an easy recipe and so nutritious! Thank you!" Chicken Broth Dog Biscuit - Our last featured treat is a long time favorite, and is easily customized for your dog. "We liked the simplicity of this recipe. My daughter wanted to make treats for our dogs and in searching we came across your website. Thank you for sharing this with everyone! Our dogs really enjoy them." "My mini schnauzer loved this recipe. I swear she waits in the kitchen while they're baking. 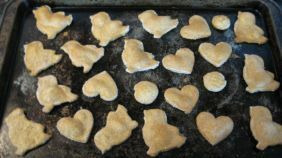 The recipe is very easy to follow and easy to double or triple to make extra for other doggie friends. I tried this with beef and chicken broth and she likes them both equally. She especially likes them when they come out soft soon after they are baked. Thanks for the recipe." "This was super easy! My beagle loves them. I added some peanut butter (but make sure to add extra flour if you're going to use peanut butter.) I pressed them out on the counter-top, but added flour first (the dough's really sticky!). I will definitely use this recipe again!!!" May is Pet Cancer Awareness Month. The thought of a cancer diagnosis in any of our loved ones, two or four legged, is devastating. But the more we are aware of the early warning signs, the easier treatment and recovery can be. Please educate yourself, talk to your dog's Veterinarian and talk to other dog owners about how to detect cancer in our companion animals. PetCancerAwareness.org - Your one stop site for education, donations and news on pet cancer. Podcasts & Webinars from the Canine Health Foundation. Animal Cancer Foundation - Even more detailed information about cancer in all companion animals. 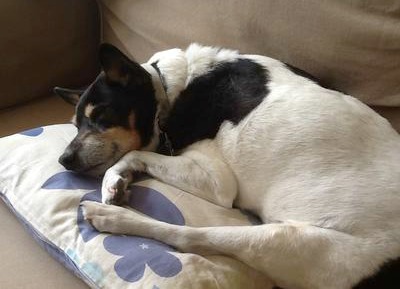 Our Featured Fan for the month of May is Reagan a Rat Terrier. My dog is Reagan and he loves to eat and sleep. Reagan is almost 16 years old! My parents have had him since he was 2 weeks old. He loves to be scratched behind the ears and he also likes it when you rub his tummy. I love Reagan with all my heart. He is so sweet! Be Our Next Featured Fan! If you'd like to have your dog be our next Featured Fan, send in a photo, description and information regarding what homemade dog treat your dog loves. Hit Reply to this newsletter, or use our Contact Us form to enter your dog to be next months Featured Fan. Join over a thousand satisfied people who have purchased my eBook. Read more about what you get in my Easy Dog Treat Recipes eBook, like 15 original recipes and over 90 original step by step photos. 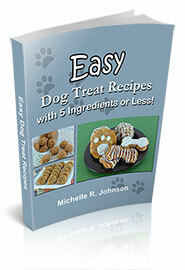 Did you know you can have my eBook, 15 Easy Dog Treat Recipes with 5 Ingredients or Less! on your Kindle device? Easy and simple dog treat recipes are waiting for you. "My little Ginger knows what she likes and "does not eat everything", but your pumpkin pie dog biscuits were a HUGE favorite for her. She loved them and went absolutly wild over them. I need to make her some more liver treats because she loved those as well. My little Ginger is a great test kitchen dog, she has approved with great enthusiasm many of your recipes, keep up the good work."